Mon., Jan. 23, 2017, 6:41 p.m. Abortion foes who filled the steps of the Capitol Building Monday were urged to move from prayer to action. 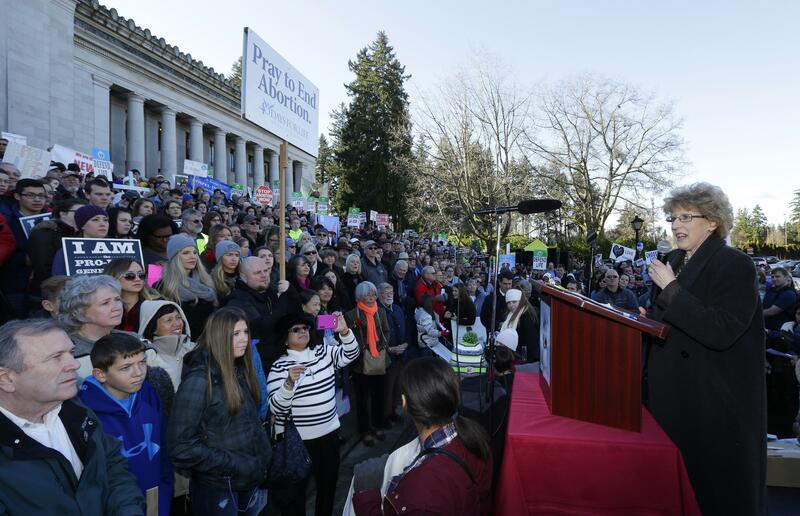 OLYMPIA – Thousands of abortion foes who filled the steps of the Washington Capitol Monday were urged to action by lawmakers who have proposals against the controversial but legal procedure. A string of lawmakers who addressed the crowd said they would try to pare back abortion rights in Washington, which had legalized abortion even before the 1973 U.S. Supreme Court ruling in Roe v. Wade. Abortion foes mark the anniversary of that decision each year with a march, speeches and prayers at the Capitol, which is often one of the largest demonstrations during the legislative session. Like many past demonstrations, a few dozen abortion rights supporters gathered on the nearby steps of the Temple of Justice with opposing signs and shouted their own slogans during many of the speeches. Shea, who urged demonstrators to be “warriors for the unborn,” said he would soon introduce legislation declaring life begins at conception. Sen. Mike Padden, R-Spokane Valley, said he would hold a hearing later this week in the Law and Justice Committee on his bill to require parents to be notified any time a minor is seeking an abortion. Others called for removing state money from Planned Parenthood, or mentioned an executive order by President Donald Trump that restricts federal money from going to overseas organizations that support abortion. “We have a different president now,” Sen. Steve O’Ban, R-Pierce County, told the cheering crowd. But the makeup of the Legislature has not changed significantly in the last three years, where restrictions on abortion that make it through the Republican-controlled Senate die in the Democratic-controlled House. Restrictions proposed in the House often do not get moved out of committee for a vote in the full chamber. Some legislators, including Rep. Bob McCaslin, R-Spokane Valley, quoted the Bible. Others, like Rep. Shelly Short, R-Addy, said an unborn baby and a person at the end of their life should have the same protections as other people. “I would not want to be on the wrong side of that issue when we all meet our Lord and Savior,” Short said. Published: Jan. 23, 2017, 6:41 p.m.